Thanks for joining me! Are you comfortable? Have you got a nice cup of tea or coffee, or maybe some hot chocolate? I have a bunch of news to share with you. 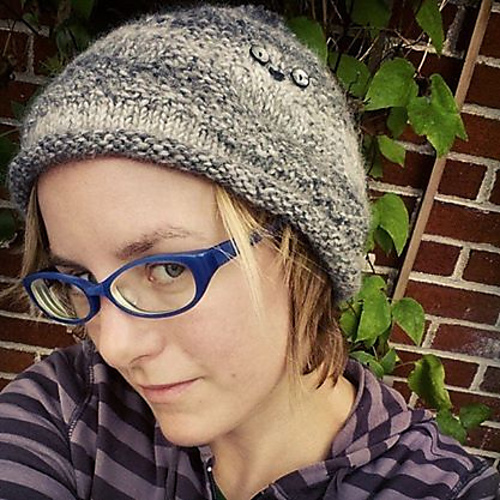 First, I recently updated my much-loved Owl Tuque pattern. It now includes 6 sizes, from newborn to adult large, so you can knit one for anyone on your gift list. The pattern works well in a variety of yarns, as long as you choose a solid or heathered colour that isn't too dark. I knit one for myself from Cascade Eco-Duo (undyed wool/alpaca) and I get compliments on it all the time! Yes, that's me. It's hard to photograph a hat on your own head. 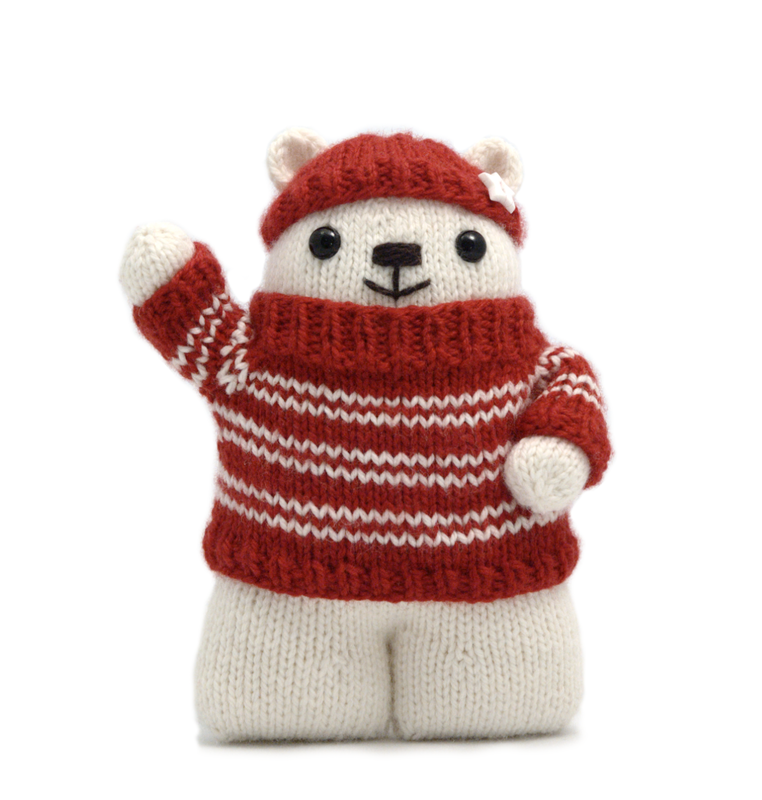 Second, I had another pattern published in Knit Now magazine last week: Ursula the Polar Bear. I took advantage of the different venue to try something a little different. She's knit all in the round, and while her shape is a bit unusual, she's really very cuddly! Plus, her cozy red pullover is the perfect attire for this cold season. If your local shops carry the magazine, it comes with the yarn to make her. Third, I have a new pattern coming soon, hopefully next week! As many of you probably guessed, the new design is for a yeti and big-foot (sasquatch), with a couple of really cute accessories. They look quite different from my other designs, but are still a fairly easy knit. 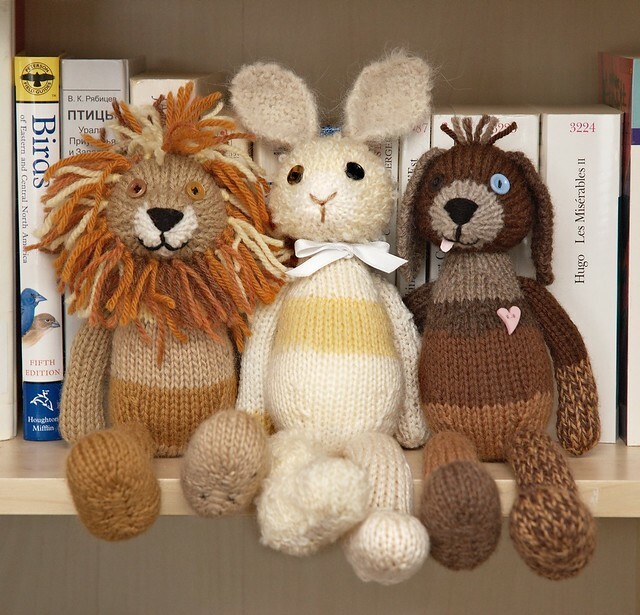 You make the toy with chunky/bulky yarn on 5 mm needles, so the knitting goes really fast. Even the assembly is somewhat easier than my usual toys. I've also started work on a little holiday pattern, which will be offered free here. That should be ready around the beginning of December. 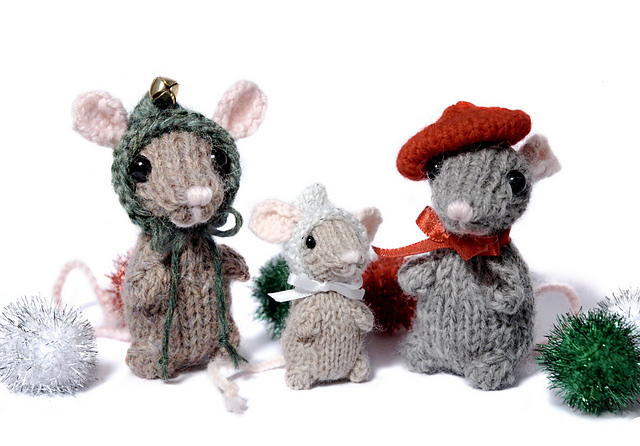 If you can't wait, try one of my patterns from previous years: mini pookies, inuk and seal, or holiday mice. 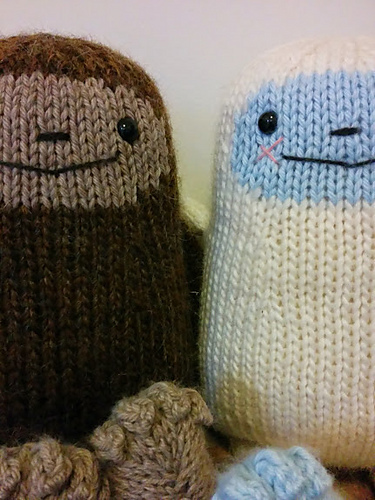 You need to knit these, right? And about some more personal news: my older son, Lev, started kindergarten this Fall. He loves school, and seems to be doing well so far. However, his new schedule and the demands of school have reduced the time I have to work. In addition, I've decided that my younger son, Kyr, would benefit from some extra time at home with me (and maybe I want to enjoy these years before he goes off to school too). So he's only attending pre-school 3 days a week now. Both of these together mean that I had to rethink what I want to do, regarding work on new designs, blog posts, tutorials, and everything else that goes into keeping Fuzzy Mitten going. So, once this year's holiday pattern is published, the pace of things is going to change over the next year and a half. I've decided to use this time to work on a longer-term project I've had in mind for a while: a third self-published collection of patterns. This will (mostly) free me from the pressure of deadlines, as well as allowing me to share my work with you as it progresses. The book will feature my Scraps Chaps designs, which have always been some of my favourites. The original three will get an update, I'll add 3 more animals to the 9 already published, and I'll design a range of outfits and accessories for the toys to wear. I hope you're as excited about this as I am! Has it really been almost 6 years since I made these guys? While the book will be my main project over the next 18 months, occasionally there will be new designs to anticipate. My work for Knit Now magazine will continue, with a new pattern every few months. As well, there will be another mystery knit-along next Spring. The mystery knit-alongs have become one of my favourite parts of this job, and I'm really looking forward to doing another one! I hope you can understand that this change of pace means I will have less time to write here. When I started this blog several years ago, so many crafty people were writing about what they were making, their family life, their thoughts and challenges and dreams. But blogging has changed since then - I don't feel like I fit into this new version, and it's too hard for my little voice to be heard. I'll still write when I have exciting news, or a new tutorial, but I think that's it. However, I do hope to make time to reorganize things, so it's easier for you to find the most useful posts. If you want any other news about what I'm up to, try following me on Facebook, Twitter, or Instagram. It's been lovely, all of you, and I hope you stick around to see where this new path takes me. Posted by Barbara Prime at 11:20 a.m.
No worries, Ms. Fuzzy. As a fan I'm here for the long haul. Will keep an eye out to see what you do next. November 21, 2014 at 11:58 a.m. Looking forward to following along with all of your future projects Barbara! November 22, 2014 at 1:04 a.m. I too put my life on hold so that I could enjoy my children while they were young...no regrets...I'd do it all again. They grow too quickly as it is, too much can be missed. Enjoy your babies Sweetie. November 24, 2014 at 6:32 a.m. Thanks for the great polar bear pattern for the kit. My Aunt is called Ursula so of course it has become a requested Xmas present......and I finished it yesterday, well in time. Thanks!! November 30, 2014 at 2:28 p.m.